That’s what I said I after taking one bite of these delicious quesadillas. 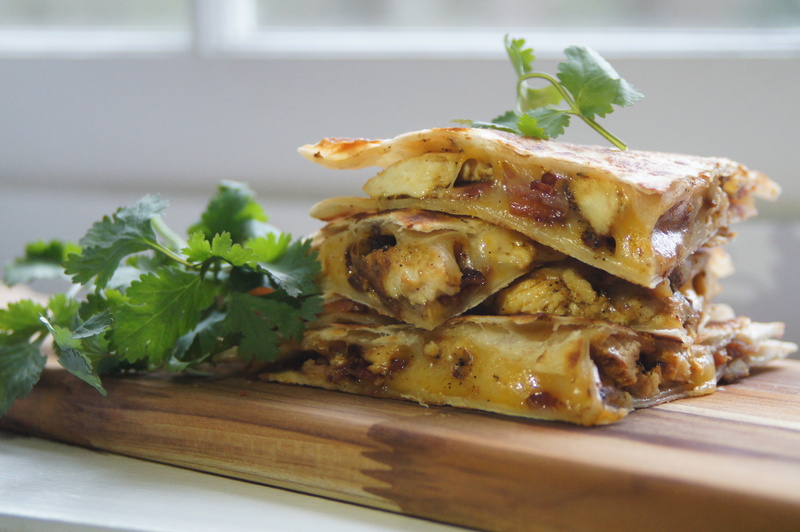 These bacon and chicken quesadillas are one of those times. With Cinco de Mayo this week I was thinking of what to make aside from tacos from a box. Apologies to authentic Mexican palettes. I’m sure “tacos from a box” is the equivalent of drenching soy sauce on anything and calling it Chinese food. Anyway, I was going through my pins and a few cookbooks and nothing was exciting me. It got to the point where I thought, maybe we’ll just make cheeseburgers and call it a day. I put all the spices in a bowl and when I mixed them together the aroma was amazing. Experimenting with these spices and never having made this before, I loved that I was already off to a good start. I rubbed the mix on the chicken and when it hit the pan to sear the sound and smell just made me smile. Then when it was done cooking and I gave it a taste test I was almost speechless. Almost because I was listening to Zayn’s album while cooking and couldn’t help but to sing along. 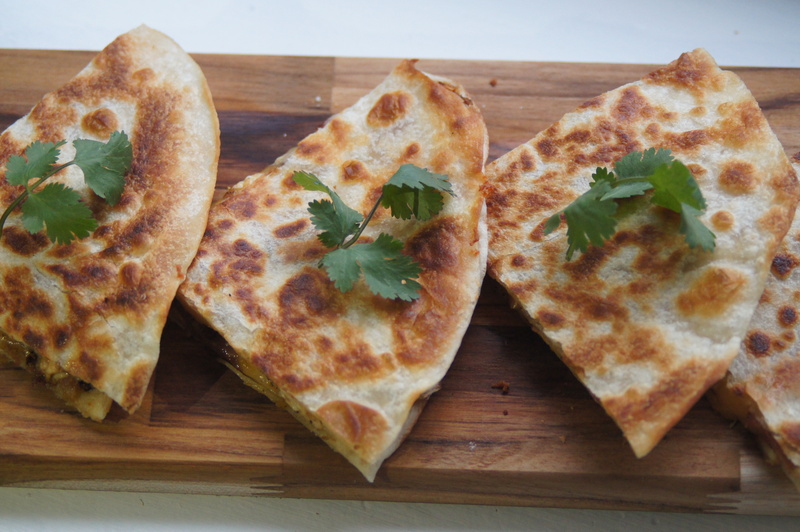 I hope you enjoy these quesadillas as much as my family and I did! You will definitely get a lot of compliments. Soak it in – because you really did just cook something awesome. Line two cookie sheets with parchment paper or non-stick aluminum foil. Arrange bacon in a single layer on cookie sheets and bake for 12 minutes. If you like your bacon really crispy bake for another 3 minutes. Once bacon is cooked, cut or tear up into bite-sized pieces. Place in a bowl and set aside. While the bacon is cooking mix cumin, chili powder, garlic powder, ground coriander, onion powder, smoked paprika, salt, and ½ tsp. dried oregano in a small bowl. Heat a 12-inch skillet to medium heat and add 3 Tablespoons oil. Pat chicken dry and cut off any excess fat. 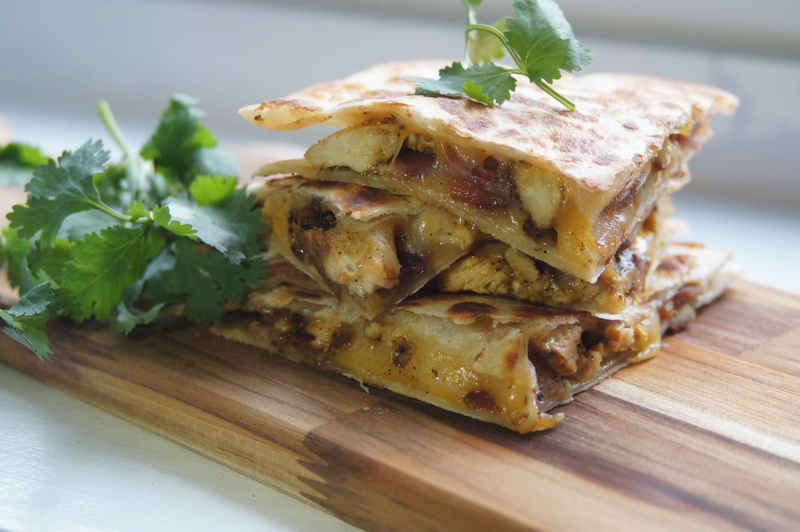 Sprinkle about one half the spice mixture on the chicken (you can use the other half as needed, or save it for another use, like the next time you make these quesadillas. *See note below). Add chicken to hot pan and cook untouched for 8 minutes. Flip over and cook for an additional 8 minutes. If your chicken is a thick cut cook for about 10-12 minutes per side. Make sure not to overcook so it doesn’t dry up. Once the chicken is cooked, place on cutting board. Let it rest for 10 minutes before slicing. Cut into bite-sized pieces and place chicken in a bowl. Set up bacon, chicken, and cheese in prepared bowls. In a 12-inch non-stick pan add ½-1 Tablespoon oil over medium heat. Working in batches, place one tortilla in the pan and spread with about 6 Tablespoons cheese. Top cheese with chicken, bacon and an additional 2-3 Tablespoons cheese. Place another tortilla on top and cook for about 2 minutes, until golden. Flip and cook for an additional 1-2 minutes until the tortilla is golden and the cheese has melted. 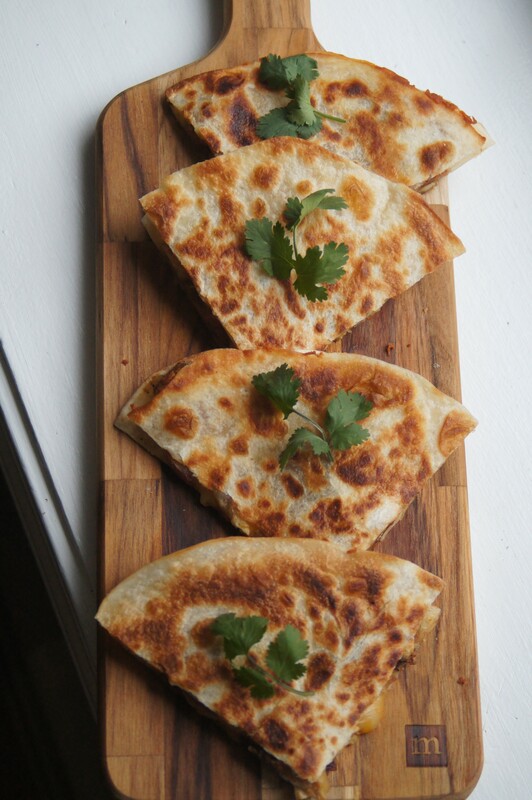 Place quesadilla on a board and cut into 4 slices. NOTE: You can also add peppers and onions to the quesadilla. Once the chicken is cooked, place about a teaspoon of oil in the pan and add sliced peppers and onions. Season with spice mixture and sauté until cooked and just beginning to soften. Set aside in a prep bowl for assembling. « The Original Recipe of the Piña Colada / Happy One Month Anniversary, The Tasty Page!